This is a WP Bakery Page Builder Addon, so it’s mandatory to have it installed & active! Using the Azon Addon you will be able to browse through Amazon Departments and Showcase Products into any WordPress page! 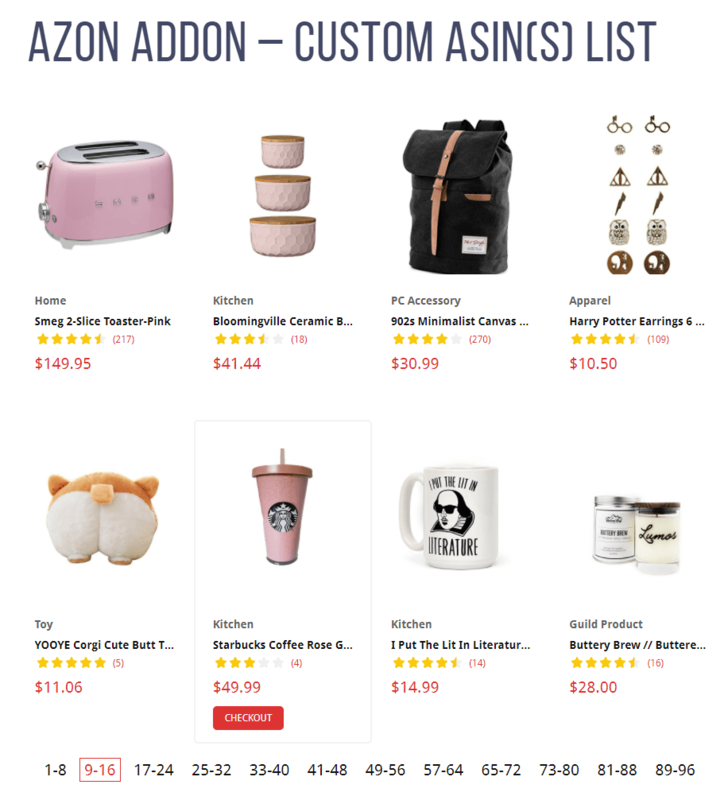 Azon – Custom ASIN(s) List – using this addon, if you already have an Amazon ASIN(s) list you can display the products in just a few clicks! To easily create ASIN(s) list, we recommend using the WooZone Chrome Extension! Azon – BestSellers – using this addon you can showcase Amazon BestSeller Products straight to your website into any WordPress Page! Azon – New Releases – using this addon you can showcase Amazon Products from the New Releases section straight to your website into any WordPress Page! Azon – Most Wished For – using this addon you can showcase Amazon Products from the Most Wished For straight to your website into any WordPress Page! Azon – Gift Ideas – using this addon you can showcase Amazon Products from the Gift Ideas straight to your website into any WordPress Page! Azon – Movers & Shakers – using this addon you can showcase Amazon Products from the Movers & Shakers straight to your website into any WordPress Page! Azon – Search Box– using this addon you can search for products on any Amazon Website and showcase those product search results into any WordPress page. 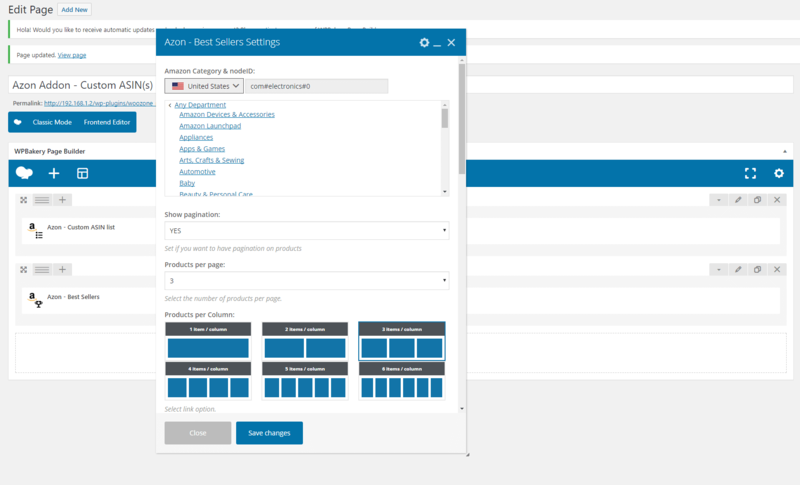 You will find the Azon Addons in the WP Bakery Page Builder, when adding a new element. Choose the Amazon Category to showcase products from. Typography options – customize the product Title, Subtitle, Price, Buy Button, Ratings color, Pagination default & active colors.